The Social Security Act defines medical necessity as follows: "Notwithstanding any other provisions of this title, no payment may be made under Part A or Part B for any expenses incurred for items or services, which are not reasonable and necessary for the diagnosis or treatment of illness or injury or to improve the functioning of a malformed body member." Well, that clarifies matters, doesn't it? With definitions like that, it's no wonder medical necessity is a much-used but often-misunderstood concept. And with health care organizations facing mounting pressure from proposed pay-for-performance directives, the confusion is bound to get worse. Perhaps the best way to help clarify medical necessity is to agree on what it's not: a clinical or patient care description. In fact, it's a coverage and payment concern. Moreover, it should never be used to cast aspersions on clinical care. Too often reimbursement and compliance professionals fail to remember this when discussing coverage issues with practitioners. I have been guilty of that misconception and watched as physicians stiffened their backs when I talked about "this service or that diagnosis code not being medically necessary." It took physicians indignantly asking how I dare imply that they were not providing the best care possible to their patients to open my eyes. They misunderstood what I meant when I said that the office visit didn't support the medical necessity for the level coded or that the brain MRI ordered for lung cancer wasn't medically necessary. The Social Security Act's definition of medical necessity is all about payment and not necessarily about patient care. It's an important distinction, especially from a compliance and coding perspective, and one that must be made clear in discussions with providers. What information do providers need to supply in order to support medical necessity? In short, documentation that links the patient's chief complaint with any problems found and a list of comorbidities that affect care, complicate treatment, or add detail to explain the actions being taken. Medicare's National Coverage Determinations (NCDs) and Local Coverage Determinations (LCDs) for some diagnostic and therapeutic services outline when or if a test is covered. NCDs and LCDs often provide specific criteria, including diagnoses that support coverage. For evaluation and management (E/M) services, the medical necessity criteria are less clear. In the EHR era, these visit types have taken on even greater importance from a coding perspective. Unlike with NCDs and LCDs, medical necessity for the level of service billed for an E/M service is solely dependent upon how well the provider thinks on paper. Coders know the three key components of history, exam, and medical decision making (MDM) usually determine the level of service a provider may bill. When the documentation guidelines were introduced in 1995, consultants often told providers to count on their fingers and toes when determining history and exam. They used bullet points to account for the updated 1997 documentation guidelines, then spent a brief time talking about MDM before moving on to selecting the level of service. 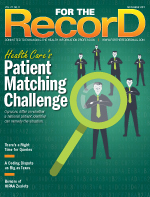 They frequently glossed over the link between MDM and medical necessity because it "only really mattered" for new patients, admissions, or consultations in which all three of the key components must be met or exceeded for coding. The MDM criteria were not a priority because they were too ambiguous to explain to practitioners or fellow coders. The arrival of EHRs and their easy-to-check-off boxes introduced problems associated with cloning and overdocumentation of history and exams. Then, there's this heretofore little-known caveat in the Centers for Medicare & Medicaid Services' manual system, Pub 100-4, Chapter 12, Subsection 30.6.1 A: Medical necessity of a service is the overarching criterion for payment in addition to the individual requirements of a CPT code. It would not be medically necessary or appropriate to bill a higher level of E/M service when a lower level of service is warranted. The volume of documentation should not be the primary influence upon which a specific level of service is billed. Documentation should support the level of service reported. What does this edict mean and how is it applied? In short, patients visit physicians to be treated and healed. Generally speaking, these encounters are documented in the assessment and plan/MDM sections of the note. The goal of this documentation is, of course, to support medical necessity. With this in mind, it's probably better if E/M documentation does not begin with history because the orderly, top-down approach can be confusing. Too often this method leads to documenting a large number of review of systems as well as the complete family and social histories. The finer points of documenting exam, especially, for example, a complete multisystem exam according to either the 1995 or 1997 guidelines, are even more complicated. The intricacies of these two key components can leave health care professionals in a daze. Worse yet, many providers may consider it easier to just document a comprehensive history and exam and let the chips fall where they may. This results in providers being confused about the coding rules for E/M services and excessive documentation. A better approach is to focus on the acuity of the patient's condition, including the comorbidities. For example, documentation should clearly indicate why one patient with a cold and poorly controlled asthma differs from other cold patients, or how it's more complex to treat an injured patient with poorly managed diabetes than an injured but otherwise healthy 18-year-old. By doing so, providers can more easily explain medical necessity. • While established office visits and subsequent hospital visits require only two of the three key components, it's vital that medical necessity be supported in the MDM. In other words, MDM should be one of the two key components to support the level of service. What does this mean for providers? They must document more than just a diagnosis code, and act and think as if they're still documenting on paper. Document the problems addressed, the comorbidities that affect treatment, and, for new issues, the concerns, if any, related to the presenting condition. Documentation of the thought process supports the acuity of care and ultimately the medical necessity of the service billed. Once the thought process is determined, focus on tying the assessment and plan (MDM) to the subjective/objective (history/exam). The key is to document the questions asked and/or what was examined that enabled the provider to make the assessment and create a plan. — Laurie Desjardins, CPC-I, director of consulting for Coding Strategies, is a speaker and coding educator in the New England region specializing in physician coding education, outpatient coding, and reimbursement issues.